Cool though it may be, the clog is not a pretty shoe. It is galumphy and unfeminine in the extreme; the kind of footwear that can be styled to look cool, but rarely to look seriously good. I do like clog sandals, however. They are walkable and fun, and while they might not be the most delicate shoes in your summer arsenal, they will be among those you reach for most. 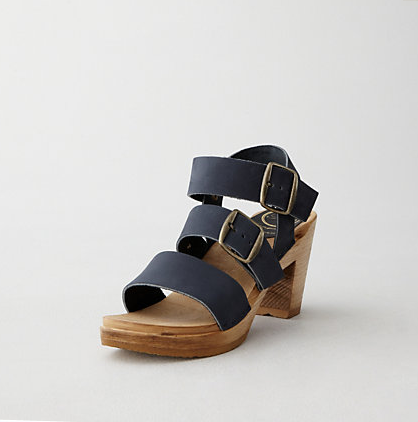 I’m considering this Loeffler Randall pair: it’s on the splurgy side, but the tri-colored straps—three great neutrals that go great together—would work with just about any color. This very classic natural leather pair suggests the 70s, but does not feel stuck there. Such strappy kick-around-on-the-weekend fun, and with some real height. Plus, the fact that these are a nice blue keeps all those straps from feeling too dark and clunky. Brooklyn’s own Nina Z makes a small line of cute clogs at decent prices, and if you’re in the borough, you can always find them on weekends at the Brooklyn Flea. That’s where I discovered this pair, which after two summers, I have worn into the ground. You can barely see this shoe’s best detail in this picture: it’s a seam coming straight up the middle of the front of the ankle strap, and it’s quite chic. Possibly the most dressed-up clog sandals in the brief history of clog sandals, in fancy silver metallic leather.